Following a sell-out UK arena tour earlier this year, Olly Murs has today announced a brand new UK arena tour to take place in March 2013. The former X Factor contestant, who is now working on his third studio album, announced a total of 13 tour dates to take place at arenas across the UK. In a video posted on his website, Olly Murs sounded excited about the 2013 tour and the thought of performing new material from his forthcoming third studio album. 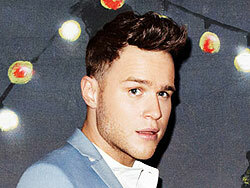 Tickets to see Olly Murs on his 2013 UK tour will go on general sale at 9am on Friday 20th April.